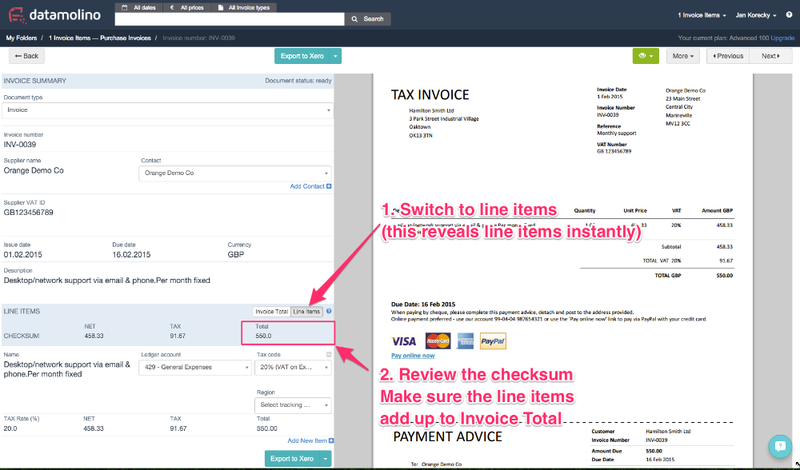 If you are in trial or use the Advanced user plan, you can benefit from line item extraction on invoices. No more waiting for results! If you create line items manually, now you have a handy checksum, so it is easy to see if your numbers add up. Using comments is now a much better experience. Now, if you hover over comment bubble in the invoice list, you can easily see the last comments on the document. This helps if you share the folder with colleagues and use Datamolino to discuss issues related to invoices and receipts. This is our first step on our roadmap to enhance the collaboration within Datamolino folders. If you have an idea for a feature, let us know through our chat system.